Are you JUST NOT IN THE MOOD to diet? Try this! You don’t have to lose your FUN in order to lose your WEIGHT. No “diet jail” for you! Whether you’ve gained 5 pounds (like me), or 50 pounds, there IS a way out. A happy way! The road to becoming THIN & BLESSED is not punishing. Not a dreary journey. Why, it’s as fun as a joyride… a joyride to thin. Good news: THIN & BLESSED is not about food! It’s about a mindset! A JOYOUS ONE! Food? It’s the least important part of it. I’ll teach you how to choose it from your own kitchen, from whatever foods authentically please your quirky preferences, lifestyle, and family. But first, let’s show ourselves to be powerful women and men of God who can set things right in our bodies and minds… and have some fun on our joyride to thin. Wheeee!!!!! 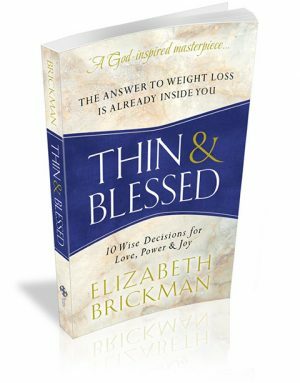 Join me for a 21-Day THIN & BLESSED CHALLENGE starting Monday, May 8. Tell your friends! May 6th, 2017 | Posted in Thin & Blessed | © Copyright 2019 The Trusted Author. 3 SECRET MONEY BELIEFS: What keeps good-hearted Christians from giving financially? The ONE ADVENTURE you don’t want to miss! AFTER DEBT MADE ME POOR, I LEARNED HOW TO BE RICH! © Copyright 2019 The Trusted Author. Website design by Art Wave, Inc.